"This chicken salad is full of the flavors of India without it being too spicy. So easy and delicious. Dried cranberries, raisins, or pineapple chunks can be added." Bring a pot of water to a boil, reduce heat, and simmer; add rosemary. Poach chicken in the hot water until no longer pink in the center, 5 to 10 minutes. An instant-read thermometer inserted into the center should read at least 165 degrees F (74 degrees C). Remove chicken with a slotted spoon and allow to cool. Discard broth. Chop chicken into chunks. 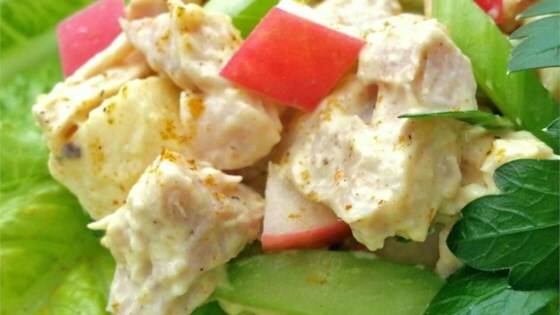 Mix chicken, apple, celery, red onion, mayonnaise, chutney, lime juice, curry powder, salt, and black pepper in a bowl. Chill in refrigerator to allow flavors to blend, at least 2 hours. Serve cold or at room temperature. Broth from cooking the chicken can be saved for a separate use. Except for using the chicken breasts that were already on hand instead of thighs, I made this salad as written. It’s excellent! Used extra chicken breast and dried rosemary. Seriously amazing! !